Smells like chai. Our Peace of Mind candle features essential oils of bergamot and cinnamon for a scent with warm and relaxing notes. Handmade by Survivors and packaged in a 2 X 3 inch aluminum tin to complement any decor. This hand-poured soy wax candle will provide up to 10 hour of burn time. Choose from a single candle or discounted multipack options. Your purchase nurtures lives harmed by intimate partner abuse. Our candles will provide up to 10 hours of burn time. Remember to trim the wick before each use and assure the wax melts all the way to the edge of the tin during the first burn. Candles have a melt memory, and this will avoid tunnel melting during subsequent usage. Smells like winter holidays. 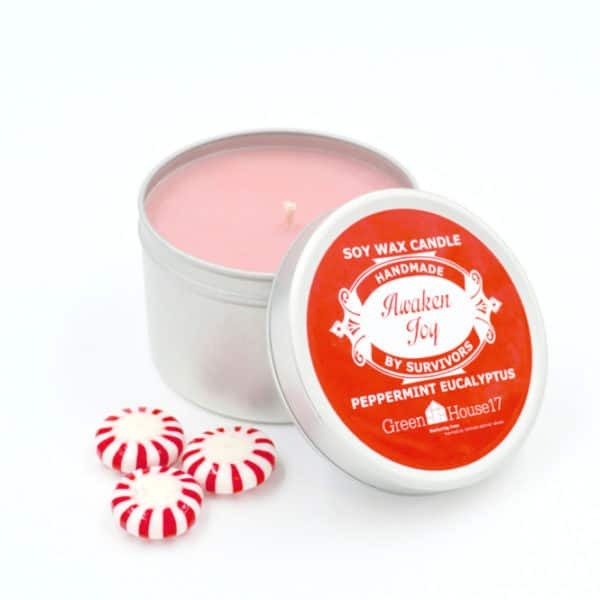 Our Awaken Joy soy wax candle features essential oils of peppermint and eucalyptus to refresh mind, body, and spirit. Handmade by Survivors and packaged in a 2 X 3 inch aluminum tin to complement any decor. This hand-poured soy wax candles will provide up to 10 hour of burn time. Choose from a single candle or discounted multipack options. Your purchase nurtures lives harmed by intimate partner abuse. Smells like a walk in the woods. 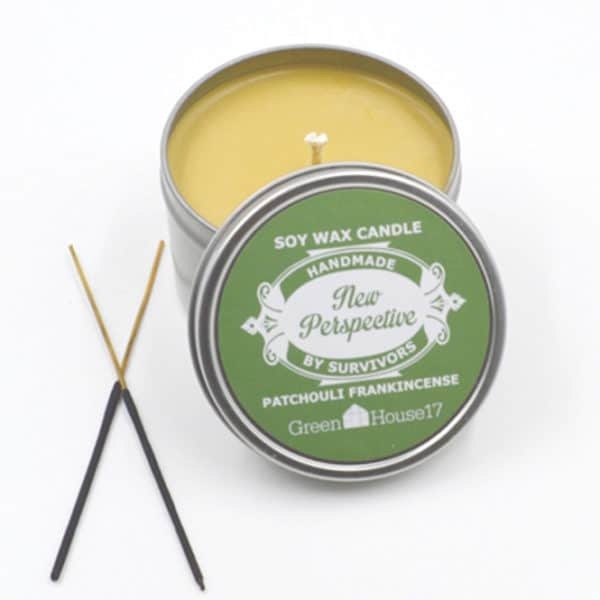 Our New Perspective candle features essential oils of patchouli and frankinscence for a scent with natural earthy notes. Handmade by Survivors and packaged in a 2 X 3 inch aluminum tin to complement any decor. This hand-poured soy wax candle will provide up to 10 hour of burn time. Choose from a single candle or discounted multipack options. Your purchase nurtures lives harmed by intimate partner abuse. 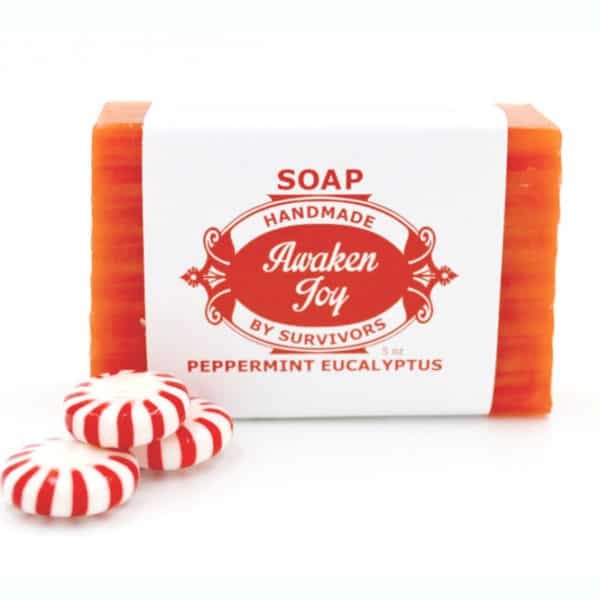 Awaken Joy combines energizing peppermint, soothing eucalyptus, and a touch of shimmer for the perfect holiday soap! Handmade By Survivors using natural ingredients that soften and nourish your skin: coconut oil, palm oil, and essential oils of peppermint, rosemary, sweet orange and eucalyptus. Each bar is shrink-wrapped and weighs approximately 5 oz. Your purchase nurtures lives harmed by intimate partner abuse. Smells so clean. 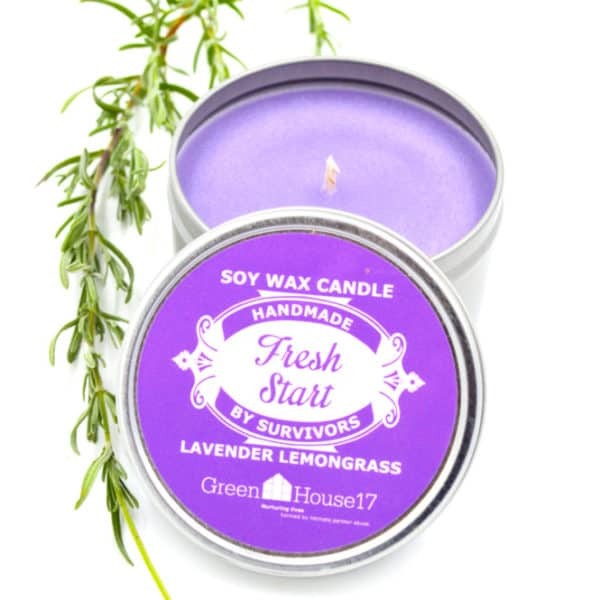 Our Fresh Start candle features essential oils of lavender and lemongrass for a relaxing scent. 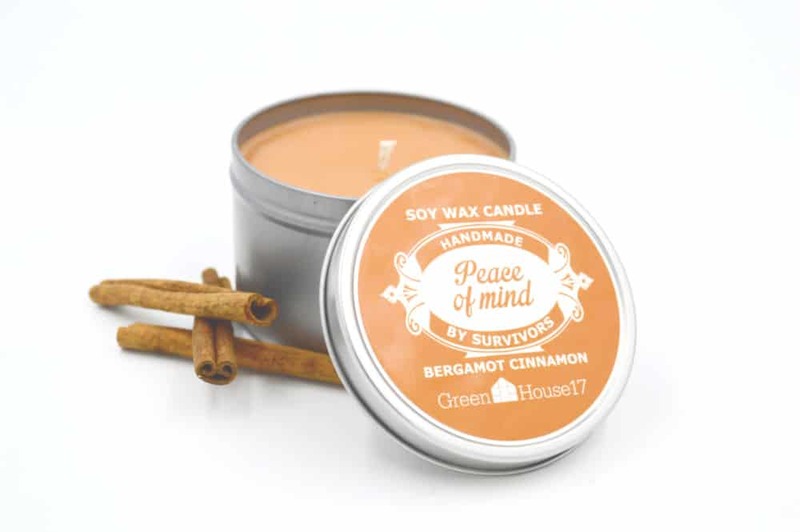 Handmade by Survivors and packaged in a 2 X 3 inch aluminum tin to complement any decor, this hand-poured soy wax candles will provide up to 10 hour of burn time. Choose from a single candle or discounted multipack options. Your purchase nurtures lives harmed by intimate partner abuse.